Series RA » Unitrack Industries, Inc. In a number of cases it is desirable to bring cool air from outside the front of a cabinet and then push the air upwards across the p.c. cards mounted in the card cage directly above. This right angle movement of cooling air is especially useful when a p.c. card cage is isolated from the flow of cabinet cooling air. 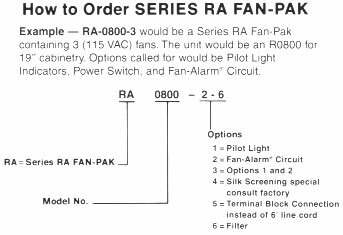 The Series RA Fan-Pak draws air through the front grill utilizing one, two or three 100cfm, long life, quiet fans. Options which will add greatly to the application and sue of a separate cooling package are available. The RA Fan-Pak is also available as an integral part of standard (or special) Unitrack card cages. By purchasing both cage and cooling package as a unit, assembly time, stocking costs, etc., may be reduced. Standard package includes switch, fuse and line cord. Replaceable fuse, 115 VAC fans and 6′ line cord are standard. Other fans are available for 12, 24, 48 VCD or 220 VAC. 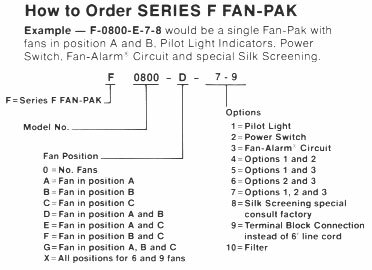 Series RA Fan-Pak is available with three fans only. Pilot Light/s: Shows that fans are ON. Power Switch: For front panel control of Power. Fan Alarm® Circuit: LED indicators show fans operating. Switch contacts are also available for remote alarm. Silk Screened Legends: consult factory. 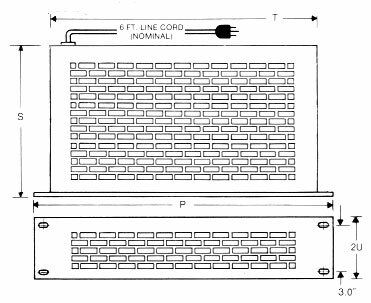 Terminal Block Connection may be desired instead of 6′ line cord, at no extra charge. If so, when ordering, signify on Part No.